An artist’s impression of the new Rouse Hill Hospital which will be built opposite the Rouse Hill Town Centre. 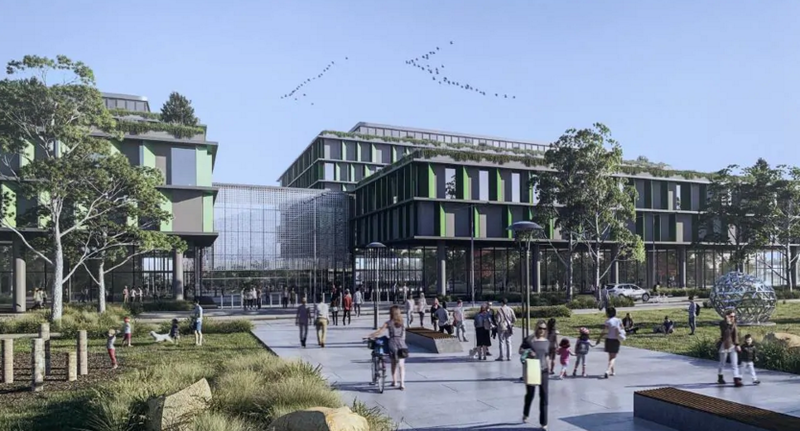 Thousands of residents across north-west Sydney are closer to having world class health services on their doorstep with the site for the Rouse Hill Hospital announced today. Minister for Health Brad Hazzard, Riverstone MP, Kevin Conolly, Castle Hill MP, Ray Williams, Baulkham Hills MP, David Elliott and Liberal candidate for Hawkesbury, Robyn Preston were all on site at 768 Windsor Road, Rouse Hill to inspect the site. The site is close to the Rouse Hill Town Centre and the new Rouse Hill Metro station, ensuring both staff and the community will be able to access the hospital easily. The acquisition of the site forms part of the NSW Government’s $300 million commitment. “Planning, early design works and community consultation will ensure we deliver what the community needs and deserves,” Mr Hazzard said. The new Rouse Hill Hospital will complement Blacktown and Mt Druitt Hospitals and Westmead Hospital to ensure comprehensive health care throughout the north west.